Saliva is produced regularly in your mouth, most especially when it is time to get some food. More than just being that transparent fluid that fills your mouth, the saliva is also important when it comes to the maintenance of a healthy oral environment. It actually helps in protecting you, your teeth and gums, from dental and oral health problems. Even though its main function is to aid in digestion, saliva also helps in upholding dental and oral wellness through a number of various ways. In connection with its role in digestion, saliva initiates the chemical digestion of food. 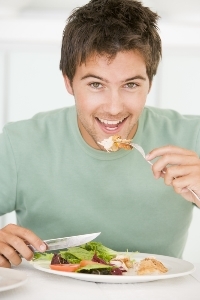 With sufficient flow of saliva, it becomes much easier for your teeth to break down the food. This reduces the stress and tension on your teeth and jaw. As such, you are less prone to tooth damage and jaw joint problems. The flow of saliva also serves as your mouth’s natural means of flushing out those unwanted entities like excess food particles and bad bacteria. This helps keep your teeth and gum looking clean and healthy. Then again, despite this cleaning mechanism provided for by saliva, you should still brush your teeth twice and use the dental floss daily. Another way that saliva protects your teeth and gum is by neutralising the level of acidity in your mouth. In addition to enamel erosion, acids also promote the buildup of bad bacteria and the formation of plaque and tartar. Saliva reduces the acidity in your mouth, thus limiting the capacity of bacteria to thrive and multiply, making you more resistant to dental and oral health problems. Your teeth are capable of restoring their damaged areas. The saliva is in-charge of supplying minerals, such as fluoride, phosphorous, and calcium, which are essential for the repair of your teeth. With a constant supply of these minerals, your teeth can readily restore themselves and become more durable and less prone to tooth damage. Learn more about keeping your teeth and gums in perfect condition. When it comes to dental health and oral wellness, consult your reliable dental care partners here at Bondi Dental. Your trusted dentist in Bondi is committed to providing you and your family with top-notch dental care so that you can enjoy healthy and beautiful smiles for a lifetime. Claim Your FREEE Consultation: Call us today on (02) 9365 7187 or simply book your appointment online. Here at Bondi Dental, we let your smile shine.